Please refer to our stock # 1931 when inquiring. T.L test included for artifact. 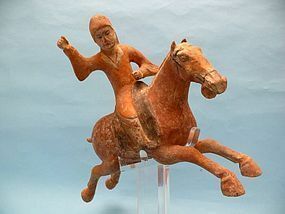 Tang dynasty Pottery Polo Player and rider in flowing robe bent at the waist to one side and head lowered while seated astride a horse depicted in full gallop. Traces of red, black, and cream pigments. Intact with some encrustation but in excellent condition. Circa 618 - 907 C.E., Artifact is 10 3/4" high and 11 1/2" front hoof to back hoof, and a total of 13" high on stand. According to Ollis & Oostermeijer in the Netherlands, it is generally regarded that the sport of Polo was introduced into China from Iran or Central Asia. Some scholars believe it originated in Tibet. However, a small group of Chinese historians claim it was a Chinese invention based on a 3rd century poem. Whichever the case, the Chinese certainly contributed to the development of the sport by perfecting the fully formed saddle and stirrups so essential to the game in its final form. There is undisputed literary and visual evidence of Polo in China that dates from the 7th and 8th Centuries in which stories tell of polo playing Emperors and members of the Royal family. According to one account a four man Chinese team led by the future Emperor Xuanzong (712 – 756 CE) defeated a ten man Tibetan team in the year 709. A mural depicting a game of Polo, dated to 706 – 711 CE, was found in the tomb of Li Xian (Crown Prince Zhanghuai (654 – 684 CE.) Ceramic Polo Players fall into two categories: males and females riding horses in full “flying gallop” and less elegant depictions of players frozen still, usually with all four, or at least three, of the horses legs attached to a rectangular base. As mentioned, Polo was not exclusively a male pastime. The new freedom given to the female in Tang China meant that the upperclass female often wearing trouser or jumpsuits joined their male (often foreign) team members on the polo field. This collaboration of Chinese women and a foreign male playing polo in public would not have been considered a breach of propriety until later periods when upper class females were strictly separated from men who were not direct relatives.